Merger and Acquisition for me is very helpful for the company. It helps them expand their business and gain more income out of it. For the employees side it could either be beneficial or not depending of course on how you see it. Of course the hassle and bustle of signing and updating your information somehow is very tedious and sometimes its kinda frustrating. Both companies involve though would ensure of course to have this transition really smooth. 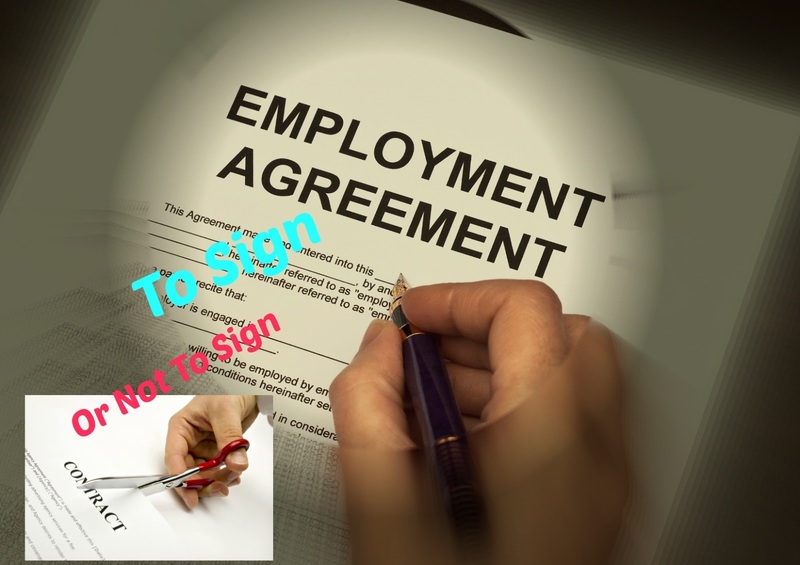 They however would let you sign a new agreement while you are waiving all legal rights to the other company. This shouldn't be a problem its like resigning and signing back to a new company, of course there might be things that would hold you back from doing so. An employee like myself would definitely have a lot of questions. Here are a few of the action that I did before I even sign a new contract. Build you confidence over the new company. I am not saying that I don't trust or I don't have confidence over the acquiring company but what I am saying is I have to assure that I am confident enough that I can live and be at par with the expectation the new company will be asking. Ask question to build the confidence. My questions should be answered directly. Research about the new company through internet. There would definitely be a lot of information out there that you could read. Make sure that you list down all your question and ask it with the Human Resource of both companies. Make sure you have listed all your questions and concerns. Keep asking your manager and or the HR people about questions that may arise before you even sign the contract. Make sure that you are enlightened and understand all line items stated in the new contract. Don't leave yourself in a clouded places and darkened thoughts. If these happens I am sure you'd end up resigning when you've discovered things are going against the way you've expected. Evaluate your benefit options. Benefit may change the moment you signed the contract. List down all the benefits that you really like and ask your new company. The questions I asked myself when before I even sign my new contract are: is this benefits really beneficial to me? Evaluate your career improvement over the new company. Of course everyone wants movement. Before the acquisition happened I already laid down my 5 year career path and listed down ways on how to achieve them including of course my long term career path. However, I know you would agree with me that it is frustrating when all of a sudden you have to change the career plan you had for yourself for the next 5 to 10 years. It is also advisable to ask the companies HR personnel about training offer, companies 5 to 10 year projections and plan in your locations. In that way you could re-evaluate your career plan as well. Think and Re-Think. After asking question and after researching and confiding my thoughts to all my friends and weigh all their feedback. I think I am ready. It is also advisable to take a day or two off from work for you to gather your thoughts and weigh things out. Its what I did, I filed a vacation leave for me to list down all my questions and the answer derived from the "Talks/ Huddle", observations, benefits, career projection and then I came up with the generalization. This is also a perfect time for you to asses yourself if you are up for the challenges in place. Expect for the worse. Another thing to consider is to set yourself an expectation to prepare for the worst, either you are signing the new contract or not. Of course either or you would still go on the new hire process. Except of course on the interview process that you'd need to undergo when you're not signing. When you did sign and to continue your job function to the new company expect that changes will take place in the next 12 months at most. New work flow and processes, new employee handbook, basically everything will be new, so you'd brace yourself to cope with the new challenge of accepting change. So it is good to set yourself a proper expectation that everything will change and that you'd need to cope with these changes pretty quickly. For me aside from what I've said, I also told myself that the moment I will sign these contract I will definitely have to accept that the culture on how I do things on my old company will of course CHANGE. Well as they always say, change is the only constant in these world. There would be people around you who will convince you to ether sign the contract or not. The reason, why I have to do what I have to do is because I would like to make sure that these is what I really wanted to do. That the decision I will make is because I have weighed my option and chose what I have to chose and its not because I was persuaded by anyone. Statements has been said. Actions has been done. By the end of the day, it is my only decision. For me, this is still my time to re-evaluate everything. Somehow in my point of view, I am signing because I am convince and that I have weighed my options, my questions are answered the way I understand it. Remember, questions are questions and it is important to you. So I welcome my self to the new chapter of my career..... Though I really really love the old one... this time around I have to condition my self that I already resigned with them and will be starting a new life with the new one. So if you have doubts and you are uncertain and not convince then don't sign.